Fly from $999 per person from select gateways and save $2,600 to $5,000 per couple off certain cabin categories of this cruise. Plus receive a free $400 per stateroom shipboard credit. Expires April 30. Click here for eligible departures. Take an extra two days in Moscow, capital of Russia, the major political, economic and cultural center of the country and the continent. Two nights in the First-Class Radisson Royal Hotel, Moscow (or similar), daily breakfasts, a guided tour of the city’s famous subway system, along with the services of a Viking host. Discover the allure of this Baltic capital, situated along the Gulf of Finland. Nicknamed “White City of the North,” its neoclassical architecture and Old Town offer sightseeing opportunities, including the Uspenski Cathedral and Sibelius Monument. Cultural capital of Finland, Helsinki boasts many museums and galleries. 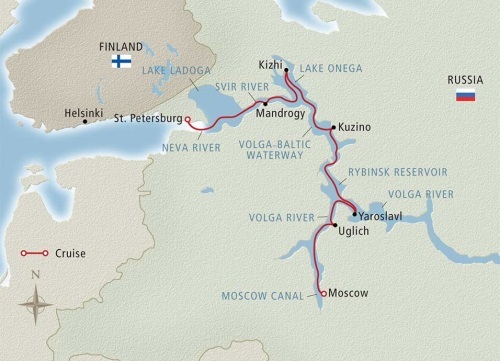 Three nights in the First-Class Radisson Blu Plaza, Helsinki (or similar), daily breakfasts, guided walking tour, transfer by train from St. Petersburg and all transfers between your hotel and ship are included, along with the services of a Viking host. Take an extra two days in St. Petersburg, Russia’s second-largest city, a major European cultural center and important port on the Baltic Sea. Two nights in the First-Class Angleterre Hotel, St. Petersburg (or similar), daily breakfasts, a guided walking tour and all transfers between your hotel and ship are included, along with the services of a Viking host.